March 18, 2019 Apex Legends’ newest character, Octane, is not in its battle pass. Octane will instead unlock in the same way that Mirage and Caustic did, which is to say, via Legend Tokens or 750 Apex Coins (about $7.50). You won’t need to purchase the battle pass to use him. Jay Frechette, community manager at developer Respawn, confirmed the news on Twitter. 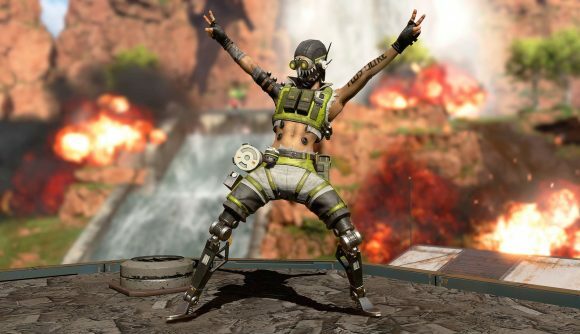 Apex Legends’ long-awaited battle pass will finally launch tomorrow. After weeks of speculation, Respawn took to Twitter earlier today to reveal that the pass, which they refer to as Wild Frontier, will be available from 10:00 PT (15:00 ET, 18:00 GMT). The video in tweet, which you can check out further down this article, reveals very little. Hidden within it are cosmetics for Mirage, Pathfinder, and Wraith, and what appears to be a new energy weapon right at the end. What the trailer itself doesn’t reveal, however, are any new characters. A voice that I initially thought might belong to a new Legend can be heard in the trailer, but as far as I can tell, it’s just the singer in the backing track. It could be that the lyric, which says “we ain’t gon’ never stop” relates to new character Octane, whose rumoured jump pads have started showing up in the game recently, but that’s purely speculative. Thankfully, more information has shown up elsewhere, confirming the battle royale’s first new addition. According to PlayStation Blog, Wild Frontier will offer at least one new skin, five Apex Packs, and 18 free stat trackers, as well as weapon skins, XP boosts, and more. You can buy the Wild Frontier pass for 950 Apex coins from the store. That blog also confirms Octane’s abilities and bio – having lost his legs in his career as a record-breaking speedrunner, his Adrenaline Junkie ability lets him trade his health for speed, and he’ll have plenty of Stims to help him heal up. If you need to get around in a hurry, you can use his ultimate, Launch Pad, to quickly jet around King’s Canyon. Beyond that, however, all we have to look at is a clip of that new weapon, and the clip of that is so small that I can’t really offer any analysis of it. All I can say for now, is that it seems to pack quite the punch.